It might be the smallest vehicle in the AMG lineup, but that hasn’t stopped the engineers at Mercedes’ high-performance skunkworks from developing one very powerful and appealing two-door sports car. The 2012 SLK55 AMG packs a monster of an engine with all of the other luxuries and state-of-the-art technologies one would expect in a Mercedes-Benz. The 2012 SLK55 AMG is powered by a new 5.5-liter, naturally aspirated V8 engine. Designated the M152 by AMG, this V8 power plant is capable of developing a hefty 415 hp at 6,800 rpm and 398 lb-ft at 4,500 rpm. The engine’s ability to push out large amounts horsepower and torque is due in large part to the number of components it shares with the M157 bi-turbo engine found in the E63 AMG, CLS63 AMG, S63 AMG and CL63 AMG. The displacement, bore/stroke, distance between cylinders, ECO stop/start system and direct gasoline injection technology are all identical in both engines. That being said, not all aspects of the two engines are similar. The intake air ducting, cylinder heads, valve drive, oil supply system and crankcase have all be adapted or modified specifically for the M152. Besides the impressive engine, the 2012 SLK55 AMG also comes with the AMG Cylinder Management cylinder shut-off system, improving overall fuel economy. When the AMG SPEEDSHIFT PLUS 7G-TRONIC automatic transmission is being operated in Controlled Efficiency or “C” mode the cylinder management system allows the engine to run on just four cylinders. However, if the driver decides they need more power all they need to do is reach 3,600 rpm. Upon reaching this speed the engine automatically engages the remaining four cylinders in a process that takes just 30 milliseconds. The sports suspension of the third generation SLK by AMG comes with Torque Vectoring Brakes, a high-performance braking system, 3-stage ESP and Direct-Steer system. The optional AMG Handling Package gives an even greater level of driving pleasure, courtesy of a stiffer AMG Performance suspension, rear axle differential lock, two-piece brake discs at the front and a three-spoke AMG Performance steering wheel. Much of the stylistic inspiration for the 2012 SLK55 AMG has been taken from the SLS AMG. A wide front grill with chrome-plated fins as well as the four air vents and center console finished in brushed aluminum are all reminiscent of the SLS super car. Rounding out the interior, other luxuries include AMG sports seats, and AMG-specific instrument cluster. 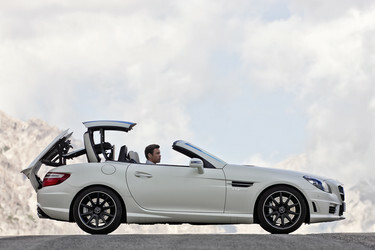 As with any SLK model, the 2012 SLK55 AMG comes standard with a retractable hardtop. But since this is the ultimate SLK Mercedes has added another option, a panoramic roof with MAGIC SKY CONTROL. This panoramic roof can change from light to dark with the push of a button, depending on the outside conditions. Now, after hearing about all the performance and technology that has been packed into AMG’s smallest offering, one might want to run down to the dealership and buy one right away. Unfortunately, those who want to add the latest two-door AMG to their garage will have to wait a little longer. 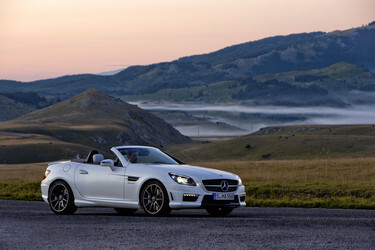 The 2012 SLK55 AMG is scheduled to go on sale in the U.S. starting in early 2012. ← POLL: Naturally Aspirated or Forced Injection?